From the Hancock County Courthouse, go east 2 blocks (0.2 mile) to Boland Street. Turn right on Boland Street (which eventually becomes Linton Rd) and go 11.7 miles to the entrance to the cemetery on the right. 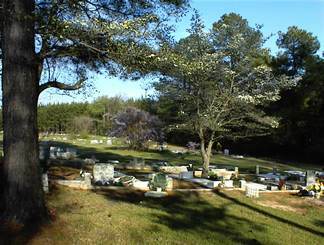 The cemetery is behind Linton Cemetery, which is visible from Linton Rd. This church was formed in 1869, after emancipation, mainly from former black members of the Darien (Baptist) Church. Graves numbered 250 or higher have been added since the original cemetery survey and are based largely on obituaries. 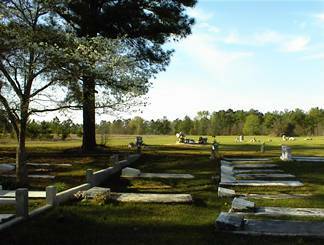 These graves are believed to be somewhere in the cemetery. Title on marker: "Deacon". Photograph on headstone. Last name and dates are very difficult to read and may not be accurate. No birth date on marker. Adult grave. Doden Baby. No dates on infant-sized slab. No birth date on adult-sized slab. The date is the only information written on the cement marker. The year is difficult to read. Maiden name, exact dates from obituary. Information on marker very difficult to read. Husband On same stone as Sally Bell Knight. Wife On same stone as Taylor Knight. L. Cpl. U.S. Marine Corps. People's Funeral Home (Milledgeville, GA) tag. First name and birth year very difficult to read. Title on marker: Deacon Photograph on headstone. God's Lamb. "C. J." trusted in The Lord. On same headstone as John Reid. On same headstone as Laura Bell Reid. Possibly four to five unmarked graves. Date was listed as death date. There was no birth date. Rest In Peace. Photograph of young man in military uniform on headstone. Very difficult to read. First and last names and year of death are best guesses. In memory of Margaret w/o Dud Sanford. We will meet again. Age 69 years. [Difficult to read.] Be thou faithful unto death. July 1904 is assumed to be the death date but may instead be birth date. Possibly 5 to 6 unmarked graves. d/o Mrs. Mary Speights. Very difficult to read. In same grave with Raynard Jordan. In same grave with Bernard Jordan. No last name and no dates. Adult-sized slab. Last name difficult to read. Age 76. Death date and age given on marker. No last name and no dates given. Adult-sized slab. No birth date. Death year difficult to read. Age 33 yrs. Is possibly buried in this area. Not found in 2002. All info per Kimbrough list. Unable to read most of inscription. Birth month might have been June. Death year is illegible. Death year per Georgia Death List 1919-1998. First name is difficult to read. Name confirmed per Georgia Death List. Birth year might be 1888. Difficult to read. First name is also difficult to read. GA PFC Co A Trans Bn. w/o Deacon Louie Hunt. Was active member of Second Darien Church. All info per obituary provided by Jeffery Monroe. Title on marker: Deacon. Masonic emblem on marker. Age 74. Info per obituary.